In the modern era religion has played a relatively small or insignificant role in foreign policy, especially among academics and professionals. International relations are assumed to be subject to rational processes and the primary motivating force is not religion but maximization of gain and minimization of loss. But the Iranians following the revolution of 1979 have been the first significant departure from this trend. Iranians have defined themselves as fundamentally Islamist and any effort to organize against them, any war or confrontation, is considered an attack on Islam. Global jihad and pressures on other Islamic countries not to partner with non-Muslim governments are part of the growing entanglements between foreign-policy and religion. The United States is oblivious, and I don’t mean that as a compliment, to issues in religion in foreign policy. They miss theological underpinnings all the time and have naïvely misread and failed to grasp incidents such as the Iranian revolution, Islamists objections to our presence in Saudi Arabia, all while we blithely armed Islamists in Afghanistan because we thought we were thwarting communism. Even our efforts at democracy promotion have failed in the face of confrontations with religious tenets that we fail to understand, ignore, and consider to be little more than inconsequential background. And probably the biggest blind spot for the United States has been the published documents by ISIS and Al Qaeda members detailing terrorism with a vision of Islam. These documents make reference to the creation of a global caliphate; foment a religiously apocalyptic narrative; and use religious motivations to recruit young believers. The US continues to fight the war on terrorism as a military and security matter and not a religious one. Theology animates ISIS such that killing them only creates more committed actors who will find new ways to subvert their enemy, namely, the US. Interestingly, it is a form of political correctness that keeps the US from acknowledging the theological underpinnings of terrorism or any other foreign policy with a basis in religion. What I mean is that American leaders do not want to be perceived as attacking Islam or being critical of Islam even if it is religious tenets rooted in Islam that justifies violence in its name. Secretary of State John Kerry and Obama might refer to gun laws, history, morals, economic deprivation, or some aberration but they never tie violence or some aggressive behavior by another group directly to theological principles of Islam. I can understand the delicate diplomatic position of the President of the United States such that he does not want to prance around the world condemning world religions. In fact, organizations like ISIS want to divide the world into Muslims and non-Muslims and blaming entire religions would play right into their hands. They succeed at this to the extent that the US blames Islam or gets involved in military actions on land that is considered caliphate. 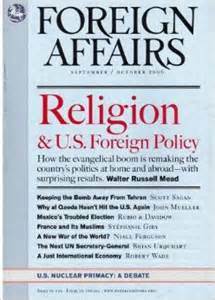 Still, our policies will be ineffectual to the extent that they fail to consider religion in foreign policy. Posted on April 25, 2016, in Political Conflict and tagged Foreign-policy, Political Islam, Religion. Bookmark the permalink. Comments Off on Religion and Foreign Policy.